The Grand-Duchy of Luxembourg became an independent state in 1839, and the British minister to Belgium was accredited to it. This non-resident status lasted until 1949, when a British legation with a resident minister was first established in Luxembourg. The end-of-terrace townhouse at 16 Boulevard Roosevelt, built in about 1900, was leased for the legation in 1950 for five years. The offices were arranged on the ground floor and the minister’s residence on the floors above. The lease was renewed in 1955 with an option for the Ministry of Works to purchase the house from the Reiffer brothers, heirs of the former landlord. The status of the mission was upgraded to an embassy in 1955 and the purchase option was exercised later that year for 5.5 million Swiss francs, about £40,000. Only four years later, the next ambassador argued that the house was in quite the wrong part of town. He may have had his eye on Bricherhof, where a much finer house was leased from the Luxembourg government as the residence for the head of the UK Delegation to the European Communities. 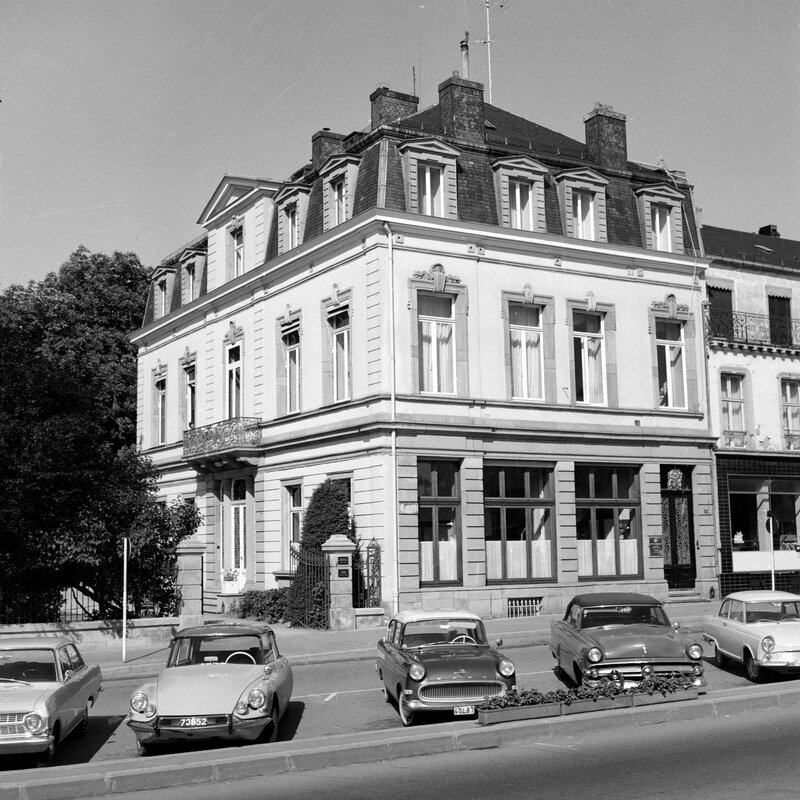 The delegation was partly based in Luxembourg (where the offices were leased at 45 Boulevard Royal) but was close to deciding to move to Brussels, thereby vacating the Bricherhof. In any event, the Ministry of Works was unimpressed by any idea of moving the bilateral ambassador. By 1968, the embassy offices had outgrown the ground floor of 16 Boulevard Roosevelt and moved to leased space on floors 6 and 7 of the CCAAL Building at 28 Boulevard Royal. No practical use could be found for the vacated offices below the residence and their space lay largely unused for many years. In 1975, the adjacent site to the residence was bought by a group which intended to demolish and rebuild the whole area, prompting alluring redevelopment ideas for the embassy site. Development principles were agreed between the Foreign Office and the Property Services Agency: the ground floor would be for offices to let, with embassy offices above and the residence on top. A sale and leaseback arrangement was proposed but no major developer appeared interested until Casteau Homes SA agreed to prepare a feasibility study. Architect Théo Worré drew up a scheme accordingly and submitted it to the City Authorities for outline planning permission. 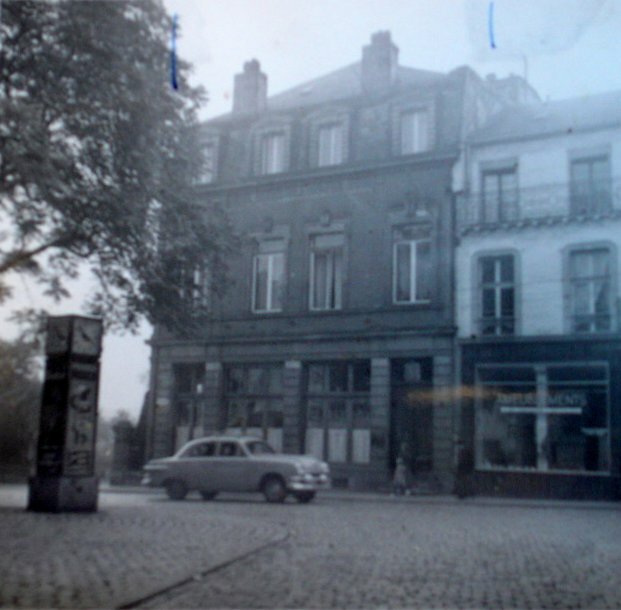 An alternative residence was even hired for five years from 1 July 1978 at 18 Rue Alphonse Munchen. But the re-development ideas for the whole area faded away and the residence remained undisturbed. FCO Ministers agreed in 1981 that the house should be retained for at least 10 years and about £225,000 was accordingly spent on uplift and security works. The adjacent site was re-developed into offices in the mid-1980s, and the embassy offices leased part of them, with interconnecting internal access, in 1986. They moved again, in the mid-2000s [? ], to 5 Boulevard Joseph II. By 2012[? ], they had contracted sufficiently [check] to return to the ground floor at 16 Boulevard Roosevelt, which they had vacated in 1968. 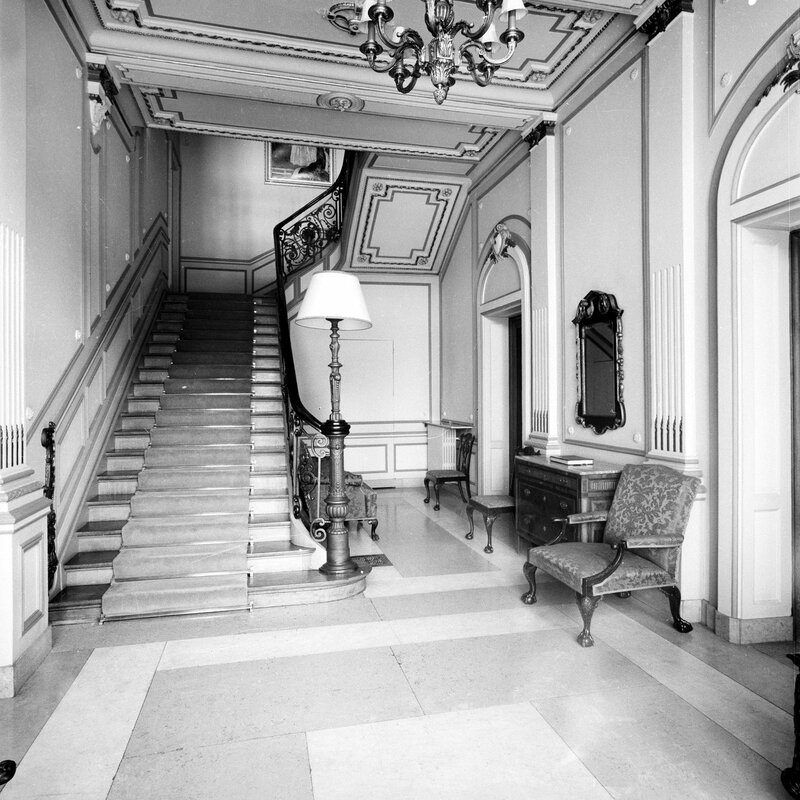 The hall of the offices and the stair to the residence, 1964.